Hisar (Haryana), Oct. 10: The scions of Haryana’s two big political families are in the fray for Thursday’s Lok Sabha by-election but for now, a third son of the soil is hogging the limelight. Arvind Kejriwal, key member of the Anna Hazare team, hails from Hisar and isn’t shy of advertising the fact at his rallies where he campaigns against the Congress. 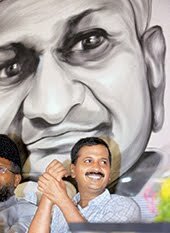 Kejriwal had arrived on Saturday armed with a recorded message from Hazare asking people to vote against the Congress. He and his associates have addressed up to half-a-dozen meetings every day across the constituency. The RTI activist has been urging voters to teach the Congress a lesson it won’t forget, one that would force it to get the Jan Lokpal bill passed. “Vote for anybody but the Congress,” exhorts the former revenue service official whom Hazare’s movement in Delhi has turned into a household name in urban middle-class India. Kejriwal denies that he or any other Team Anna member has any political ambitions apart from forcing the passage of the bill in Parliament’s winter session. But to the 2,000 gathered at Adampur, Kejriwal was already their leader. “He is one of our own. He is qualified and is fighting corruption,” said Vikas Bansal, 25, who claimed to have donated handsomely to fund Kejriwal’s meetings. Bansal was one of many traders at the meeting. With Hazare strategically keeping himself away from Hisar, Kejriwal is clearly the leader of Team Anna, which includes one of his uncles. The activist’s appeal to vote against the Congress has been received well, at least by the crowds at Adampur and other non-Jat gatherings. The traders, as Bansal and others readily conceded, are traditional BJP voters. Elsewhere, the fight is one between Jats, represented by Congress chief minister Bhupinder Singh Hooda, and non-Jats. Of Hisar’s 13 lakh voters, five lakh are Jats. Team Anna has focused on the non-Jat areas. “Hooda has done very little development work for Hisar because his party lost here in 2009,” said Sunil Kumar, a Bishnoi and a supporter of former chief minister Bhajan Lal’s son Kuldip Bishnoi. Kuldip belongs to the Haryana Janhit Congress, a BJP ally, and is seen as the favourite. His rivals are former chief minister Om Prakash Chautala’s son Ajay Chautala and the Congress’s Jai Prakash. In the 2009 Lok Sabha polls, Bhajan Lal of Janhit had won a close contest against Sampat Singh, Chautala’s candidate from the Indian National Lok Dal. Bhajan’s death in June precipitated the by-election. Kuldip’s supporters hope that the Congress and Chautala will divide the Jat votes between themselves while their leader garners the support of the other communities, including the sizeable Dalit population. The Bahujan Samaj Party is not contesting. The Congress had nearly thrown in the towel because of infighting over the ticket, but Hooda has made it a matter of prestige now that Team Anna has entered the scene. He has been in Hisar since September 27 and has visited 100-odd villages. The Congress is under pressure to do better than 2009, when Jai Prakash came third. Jai Prakash has won the seat three times before. In his speeches, Kejriwal says he knows the Congress is losing. “But it should be a loss that it remembers a long time. But please, do vote or these Congresswallahs will cast fake votes,” he says. Hisar’s political workers are aware of the battle’s significance. “It will be like the 1977 Jabalpur by-election, which signalled the end of Indira Gandhi’s Congress in the post-Emergency polls,” said RSS worker Hans Raj. If Kejriwal is right, the by-election should rather be a repeat of the 1988 Allahabad by-election when V.P. Singh returned to his hometown to campaign against the Congress at the height of the Bofors controversy. A united Opposition defeated the Congress, heralding the Rajiv Gandhi government’s ouster in the 1989 general election. “If the Congress loses here, India will win. The Congress does not understand the language of fasts but that of votes,” Kejriwal said. His rallies haven’t been uneventful: at nearly every meeting, a lone Congress worker has got up to ask questions. “There might be some bad apples in the Congress but not all are corrupt,” a Congress worker, Rajkumar Khichar, shouted at one meeting but was hooted down. “But they support the Jan Lokpal bill. Once the bill is enacted, it will take care of all corrupt MPs, including the one you elect from here,” Kejriwal said, imploring the crowd not to expect cash or liquor bottles this time. The warning seemed necessary in an area where liquor shops are the first to open in the morning and the last to close at night.